Then, in the original 7th edition Cult Mechanicus codex, I saw an entry on the Ever-Faithful, Kastelan Robots who serve no since Forge World. They seem as if they are mysterious Ronin-like warriors who join the battle out of no where and leave the battlefield without a trace. This seems very strange to me, especially since they are mindless robots that require a Datasmith in order to even function. I am the first to admit that I don't know a whole lot about the overall narrative of Warhammer 40,000 and am pretty much in it for the pretty models. I tend to come up with my own ideas on how the narrative works, and those idea tend be call called heretical by my friends who are more investing in the official fiction. But, it is what it is. 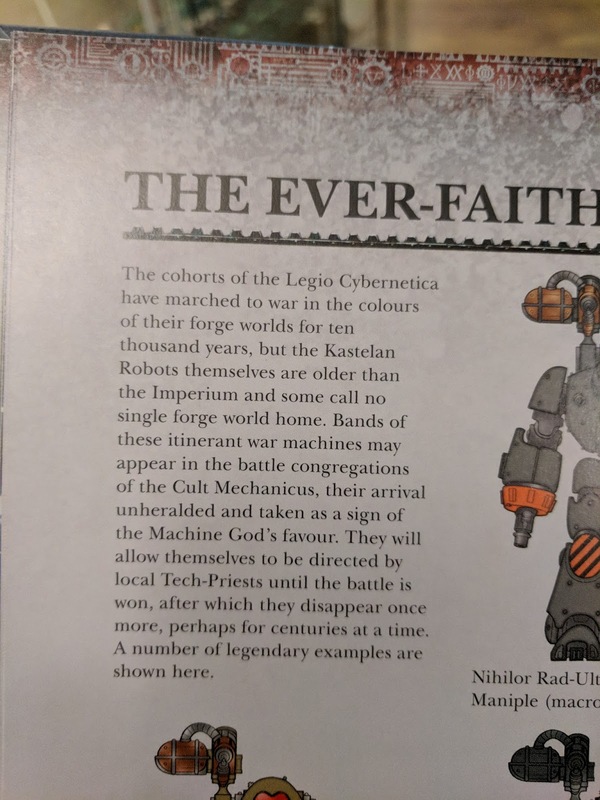 That said, the Ever-Faithful did get my brain working and I began to imagine a faction of Adeptus Mechanicus who travel the warp looking for these robots, repairing them, and bringing them back into service. Each coming from different locations, such as space hulks, past battlefields or decrepit and abandoned bases/manufactoriums. This thought lead me to search for replacement heads for them, so I could play off the uniqueness idea some more, especially the idea that some of these robots might be missing parts. That's when I came across the Grim Skull heads for them and fell in love instantly. These heads replace the original ones and give the look that the original head shroud has been removed, revealing the robotics underneath. Its a great look and I needed to do something with them. 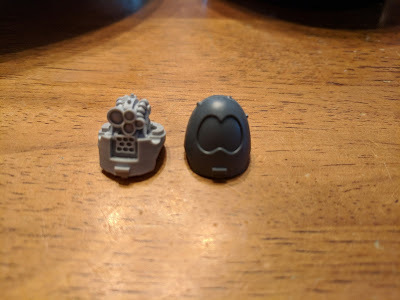 Over the last year, I kept looking at the two robots I already owned and the replacement heads. I hemmed and hawed about it, but never really did anything with the them. At this point, I hadn't actually played 40k and the idea of building my robot army kind of faded away. That is, until the rules for the Adepticon 40k Friendly were released and I realized I could run a Spearhead detachment full of robots! With that in mind, I ordered up the rest of the kits I needed for the army list and some heads, along with some spare heads for testing an idea. I would cast a head over top of another head! 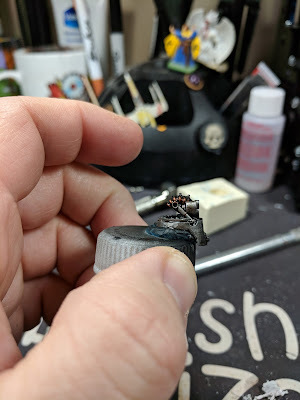 Once the Grim Skull heads arrived, it seemed like it was quite the possibility, but I wouldn't know until I actually tried it. 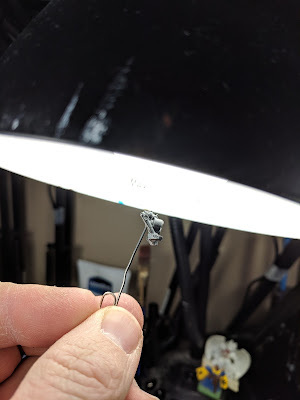 So, I bought a kit for making silicone molds and went to work. 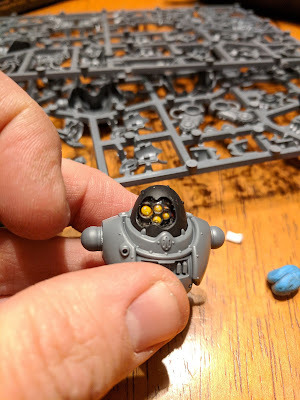 The first thing to do was to assemble one of the original heads and clean it up so I got as clean of a cast as I could. This was then filled with clay and a pour box was built around it. To make the box, I took foam core board and cut it to make a surround. This was then glued to another piece of foam core board with hot glue. 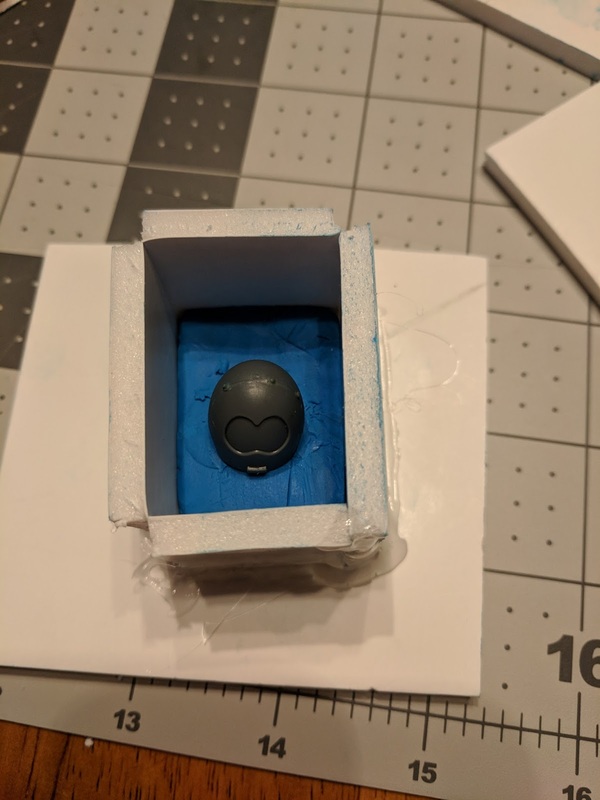 I then mixed the silicone and poured it into the box and left it sit for the next 18+ hours. Once the silicone was fully cured, it was time to remove the original and check my mold out. The mold looked damn near perfect and I was hyped to get a test head made. I wasn't sure how I was going to go about it, until I realized that only the front of the head would be visible through the lens and I could do whatever I wanted to with the rear of the head. Hobby saw in hand, I cut out the rear of the head, just below the pistons on the sides of the face. 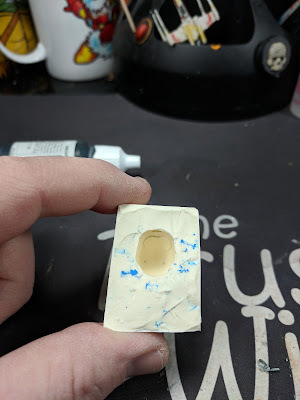 I then drilled out the bottom of it to allow the resin to travel into the mold as well as cut extra venting in the front of it to allow air to escape from in front of the face easier. With the head all prepped I primed and painted it, making sure that any areas that may be visible through the lens would be well painted. 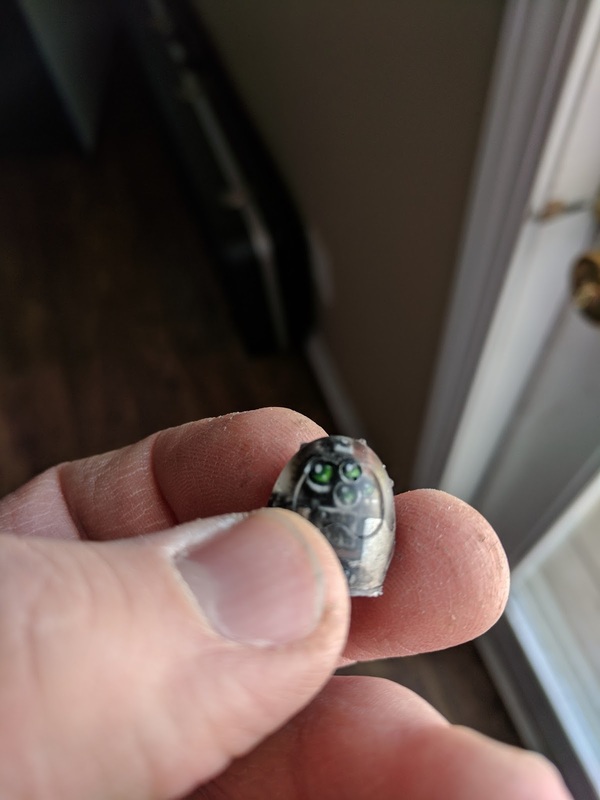 Once the paint was dry, the head was loaded into the mold and covered in resin. 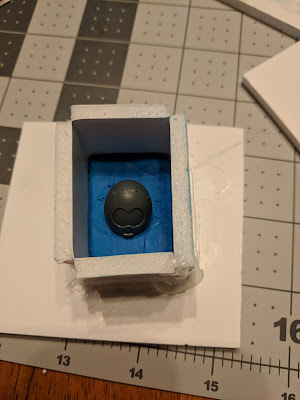 To make sure that I got even coverage I poured the resin in slowly and worked the mold by stretching it, tapping it and angling it. This, I hoped would help move any air bubbles around and get the resin where it needed to be. Another 18 hours and the results were in! The test head worked out really nicely and everything seemed to fit inside the casting really well. The "eyes" of the replacement head didn't line up with the lens on the recast head though and it was decided that I needed to remedy that. I had thought about different ways that I wanted to make it work. But I felt that if I just tried lowering it in the head, it wouldn't work and the eyes would poke through the lens. With that in mind, I went to work on the 2nd test head. This time I cut away all but the front half of the head and voice box. The plan for the next test was to suspend it inside the mold, allowing me to hold it away from the front of the mask. So with that in mind, I drilled it and glued a pin into the back of the head and then went about figuring out placement inside the mold. Once I was pleased with the positioning of it. I held it in place with my helping hands and then mixed the resin. 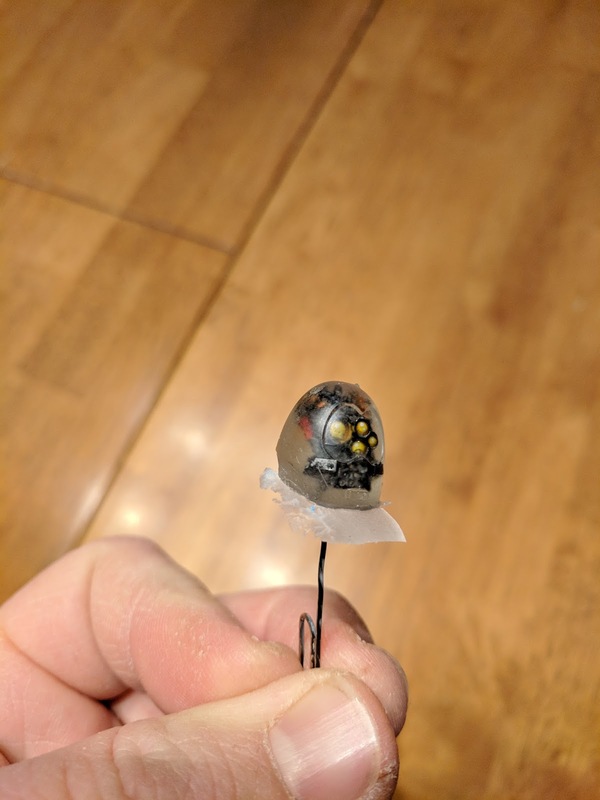 18 hours later, I had a brand new head and the eyes were exactly where I wanted them! I painted the "shell" area black and put a bit of gloss on the lens area and I'm really happy with the results. Excited to see what it looked like on a robot, I snipped the chest and back out of a sprue and put the head inside. I love the results and can't wait to get the rest of the heads painted and molded! Until next time, you can catch progress on Twitter, Instagram and watch me stream Mon & Thurs at 8pm on Twitch! Hey that is really great! it would be interesting to see one done with a bit of dust/frosting on the glass over the lenses too. Thanks! And yep, I'll be adding scratches and wear/tear to them. Once I get them all painted. That's so cool. I love the end result. 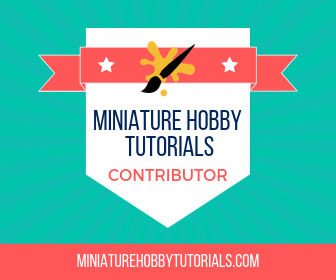 This is the thing I love about the hobby, how one idea leads you down new roads, trying new things, and just generally learning. It's an awesome feeling when it all works out. Ha ya. I've been brainstorming ways to use it for other things. Like Command Point tokens, etc.